Religion is what people believe about the meaning of existence, how they conceive of the holy and the source and end of life, and how they define personal obligation. Believers come to understand these things from a particular perspective within communities of faith, which give each generation the mental and emotional tools with which to encounter the daily tasks and momentous events that affect every human life. Native peoples living in what is now North Carolina shared religious ideas and experiences across the generations for hundreds of years before European discovery and settlement took place in the sixteenth and seventeenth centuries. With the Europeans came a greater complexity in the religious makeup of the region, and different ways of Christian worship were added to native variations. North Carolina's Christian faithful have not always agreed on what the Bible means or how they are required to practice their faith. The resulting conflicts created long-lasting conversations among different faith communities and birthed a pluralism that was made more complex by the immigration of non-Christians in subsequent eras. By the beginning of the twenty-first century, North Carolina Christians practiced their faith alongside Jews, Buddhists, Muslims, Hindus, and other groups. 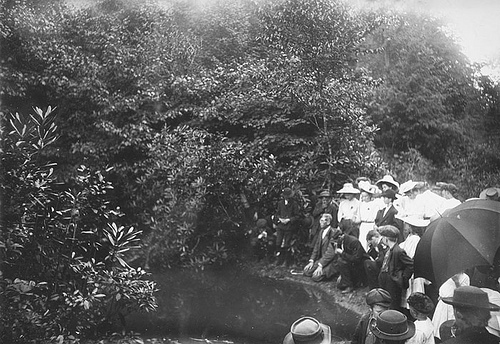 Holiness Baptizing Frank W. Bicknell Photograph Collection, PhC.8, North Carolina State Archives, Raleigh, NC. Call #: PhC8_209. Available from http://www.flickr.com/photos/north-carolina-state-archives/2744098079/ (accessed June 11, 2012).